Susannah Blackmon is desperate when she learns her fiancé jilted her and her dowry is gone. Her guardian devises a nefarious scheme to ensnare Susannah in an unsavory life, and she knows she must flee. But to where? When she meets a mysterious stranger at a masquerade ball, he inadvertently directs her to his family’s vicar, and she heads to the seacoast to escape the worst. But drat it all—her mystery counselor invades her newfound space, and she risks exposure. Will she ever redeem the life her parents had hoped for her? Nick Daventry is a widower, with a young son, whose family is encouraging him to remarry. But Nick never expects to find love again. When he discovers his inheritance is in jeopardy thanks to a crazy provision in his grandfather’s will, he puts everything he has into saving it. He returns to his coastal home, only to encounter a deceiver in the form of a devilishly beautiful woman he’d traveled all the way from London to escape. But is she the key to redeeming what is lost? 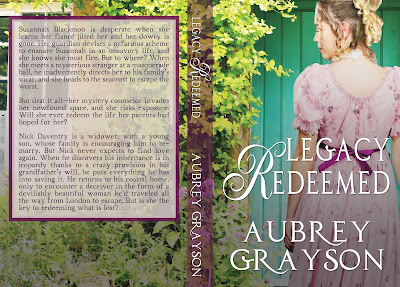 Legacy Redeemed is available now in ebook and print format on Amazon! 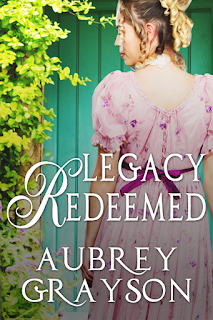 Add it to to your shelves on Goodreads, and visit Aubrey on Facebook.